PLM13 was organized by Ecole Centrale de Nantes at La Cité Nantes Events Center, from 6 to 10 July 2013. Main organizer was prof. Alain Bernard. For PLM13 programme, Click here. For details about PLM13 keynotes, Click here. 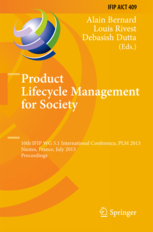 PLM13 proceedings have been distributed electronically at the conference. The final book of PLM13 proceedings has been published by Springer.